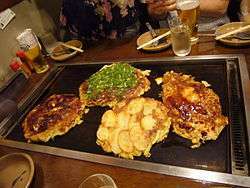 A pancake is a flat cake, often thin, and round, prepared from a starch-based batter that may also contain eggs, milk and butter, and cooked on a hot surface such as a griddle or frying pan, often in oil or butter. 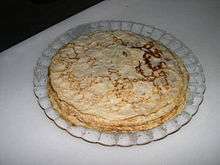 In Britain, pancakes are often unleavened, and resemble a crêpe. In North America, a raising agent is used (typically baking powder). 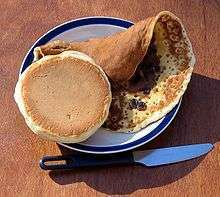 The American pancake is similar to a Scotch pancake or drop scone. 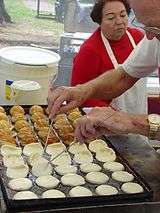 Commercially prepared pancake mixes are produced in some countries. 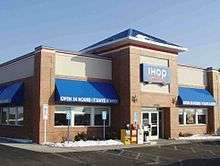 They may be served at any time with a variety of toppings or fillings including jam, fruit, syrup, chocolate chips, or meat. In America, they are typically considered to be a breakfast food. In Britain and the Commonwealth, they are associated with Shrove Tuesday, commonly known as Pancake Day, when perishable ingredients had to be used up before the fasting period of Lent began. Archaeological evidence suggests that pancakes are probably the earliest and most widespread cereal food eaten in prehistoric societies. The pancake's shape and structure varies worldwide. 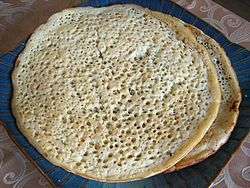 A crêpe is a thin Breton pancake cooked on one or both sides in a special pan or crepe maker to achieve a lacelike network of fine bubbles. A well-known variation originating in southeast Europe is palačinke, a thin moist pancake fried on both sides and filled with jam, cheese cream, chocolate, or ground walnuts, but many other fillings, both sweet or savoury, can also be used. Banana pancakes are a menu item in Western-oriented backpackers' cafes in Asian countries such as Thailand, Cambodia, Vietnam, India, and China. This has elicited the term Banana Pancake Trail. Chinese pancakes may be either savoury or sweet, and are generally made with dough rather than batter. The dough mostly consists of water, flour, and vegetable oil. The dish can be served as a side, usually alongside duck, or as a snack, topped with scallions and hot & sour sauce. 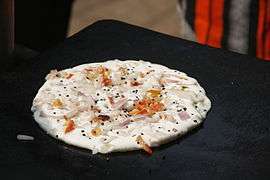 India has many styles of pancake. Variations range from their taste to the main ingredient used. All are made without the use of a raising agent. The Indonesian pancake serabi is made from rice flour and coconut milk. 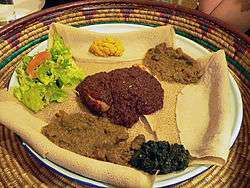 The dish is often served with kinca, a thick, brown-colored coconut sugar syrup. Other toppings may include sugar, ground peanuts, sliced bananas, jackfruit, and other fruits, and chocolate. Other variations include cheddar cheese, corned beef, shredded chicken, and sausage. 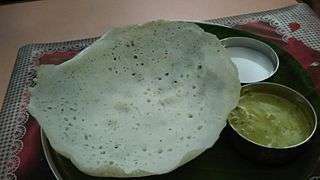 The traditional Malay pancake in Malaysia and Singapore is called lempeng. Cooked very similarly to an American or Canadian style pancake, it is served usually during the breakfast hours with curry or rendang. In the Philippines, bibingka is made from rice flour, eggs, and coconut milk. The batter is placed in a clay pan lined with banana leaves, and is grilled over hot coal. It is then served with salted duck egg, grated coconut, and sugar. 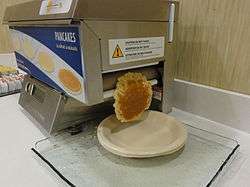 The North American variety of pancakes, or "hotcakes", is also recognized, and despite it being commonly prepared for breakfast, it can also be eaten as a afternoon snack, with street kiosks selling small hotcakes topped with margarine and sugar. In Vietnamese cuisine there is a variety of traditional pancakes; these include bánh xèo and bánh khọt in southern Vietnam, and bánh căn and bánh khoái in central Vietnam. Small thick pancakes made from yoghurt-, kefir- or soured milk-based batter (without yeast) are called oladyi (оладьи) (diminutive: oladushki оладушки, further abbreviated as ladushki ладушки), oladky (Ukrainian: оладки). The batter may contain various additions, such as apple and raisins. Finnish pancakes greatly resemble plättar (see the description in the Sweden section below) and are called lettu, lätty, räiskäle or ohukainen". In Finland pancakes are usually eaten as dessert with whipped cream or pancake-jam, sugar or vanilla ice cream. In Finnish, lettu and pannukakku (literally "pancake") have different meanings, the latter having a structurally closer resemblance to a hotcake, and is baked in an oven instead of using a frying pan. 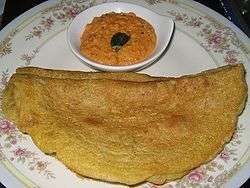 Ålandspannkaka, literally "pancake of Åland", is an extra thick variety of oven-pancake that includes the addition of cardamom and either rice- or semonia porridge to the dough. German pancakes are known as Pfannkuchen (from the German Pfanne and Kuchen meaning "pan" and "cake") except in Berlin, Brandenburg and Saxony, where Pfannkuchen are Berliner pastries and pancakes are known as Eierkuchen. 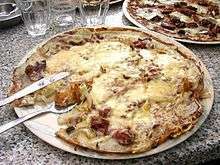 They are generally thicker than French-style crêpes and usually served with sweet or, occasionally, savoury fillings. 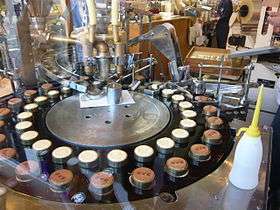 Usage of a leavening agent or yeast is uncommon. Fried apple rings covered by pancake dough and served with sugar and cinnamon are called Apfelküchle. 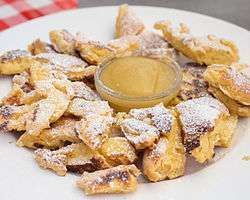 Kaiserschmarrn, a thick but light caramelized pancake popular in Bavaria and regions of the former Austria-Hungary, is usually split into pieces, filled with fruits or nuts, sprinkled with powdered sugar and served with a fruit sauce. It is believed that this was first prepared for Kaiser Franz Joseph I of Austria. Welsh pancakes, known as crempog, ffroes and other names, vary considerably. 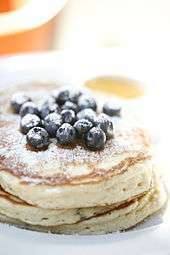 Some are very much like American pancakes, others may be made with yeast (called crempog furum) or oatmeal (although this is also true of American pancakes) and some are like Scotch pancakes. 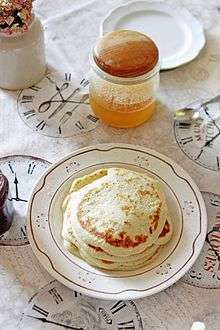 Crumpets and pikelets are sometimes considered a variety of pancake. 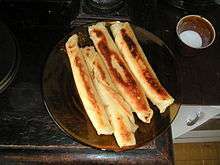 Greek pancakes are called tiganites (τηγανίτες, from the ancient Greek τηγανίτης) and are popular across Greece and Cyprus. They are slightly thicker than crêpes and can be sweet or savoury. 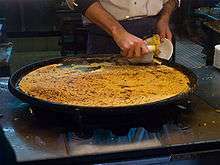 Their main ingredients are flour, olive oil or butter, milk and eggs. They are usually drizzled with honey and cinnamon, and sometimes topped with cheese, nuts, fruits or vegetables. Various small shops in Cyprus called creperies sell crepes, either savoury or sweet varieties. Tiganites can be served for breakfast or dessert, and in some places like Corfu, patras are customarily served in the feast days of Saint Spyridon and Saint Andrew. In Cyprus the pancake recipe is used for a similar dish such as Genoese canelloni – ground meat with tomato sauce, cheese, and sometimes bechamel sauce – instead of the traditional cannelloni dried pasta sold at supermarkets. In Hungary, pancakes known as palacsinta (derived from the Latin placenta) are made from flour, milk or soda water, sugar, and eggs. Sweet wine is added to the batter. 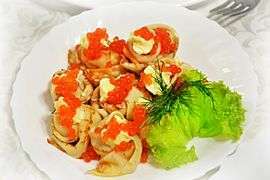 The filling is usually jam, sugared and ground walnuts or poppy seeds, sugared cottage cheese, sugared cocoa, or cinnamon powder, but meat and mushroom fillings are also used (see Hortobágyi palacsinta). Gundel palacsinta is a Hungarian pancake stuffed with walnuts, zest, raisins and rum that is served in chocolate sauce and is often flambéed. Hungarian pancakes are served as a main dish or as a dessert. 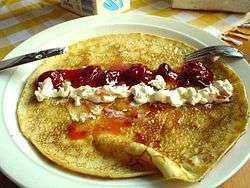 Icelandic crepe-like pancakes are called "pönnukaka", and smaller, thicker pancakes resembling North American pancakes are called "lumma"/"skonsa". The pancakes are usually a bit browner than the traditional Swedish ones. 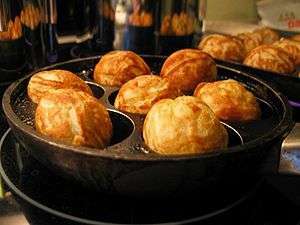 Pönnukaka are usually cooked on a special Icelandic pancake pan, which is made to get the pancake as thin as possible, and it is important to never wash the pan, not even with water. Pönnukaka are traditionally served rolled up with sugar or folded with jam and whipped cream, but if eaten at a café they might contain ice cream instead. In Iceland, North American-style pancakes are cut in half and used as sandwich bread, similar to Icelandic flatbread. In Poland, thin crêpe-style pancakes are called naleśniki (pronounced naleshniki). 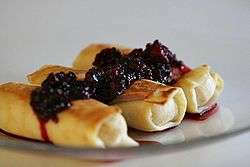 Like any crêpe or blintz, they can be served with a variety of savoury or sweet fillings as a main dish or a dessert. Sweet fillings include fresh fruits (e.g. bilberries), jams, and soft white cheese with sugar. Savoury fillings include fried vegetables, fried chicken, minced meat, and a variety of added ingredients such as potatoes, mushrooms, cabbage or ham. Another Polish dish reassembling pancakes are racuchy. They are smaller and thicker than naleśniki and can be stuffed with apple slices. Mexican hotcakes are similar to Americn pancakes. Crêpes became popular toward the end of the 19th century after their introduction by the French sometime between the First French Intervention (1838) and the Second French Intervention in Mexico (1861–67). Hotcakes are often made with cornmeal, as well as, or instead of wheat flour. 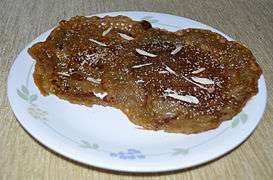 Hotcakes are popular breakfast items at restaurants throughout the country, and are often sold by street vendors in cities and during the local celebrations of towns through the day. They are also sold during fairs; the vendors sell a single hotcake topped with different sauces such as condensed milk, fruit jam or a sweet goat milk spread called cajeta. 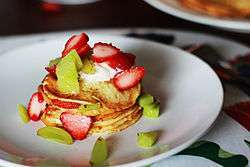 American and Canadian pancakes (sometimes called hotcakes, griddlecakes, or flapjacks) are usually served at breakfast, in a stack of two or three, topped with real or artificial maple syrup and butter. They are often served with sides such as bacon, toast, eggs or sausage. Other popular topping alternatives include jam, peanut butter, nuts, fruit, honey, powdered sugar, whipped cream, cane syrup, cinnamon and sugar, and molasses. In addition, when a pancake is occasionally served as a desert, toppings such as ice cream, chocolate syrup, and various fruits are often used. Sourdough was used by prospectors and pioneers to make pancakes without having to buy yeast. Prospectors would carry a pot of sourdough to make pancakes and bread, as it could last indefinitely, needing only flour and water to replenish it. Sourdough pancakes are now a particular specialty in Alaska. In some circles in New Zealand, very thin, crêpe-like or English pancake-like pancakes (around 20 cm [7.9 in] in diameter) are served with butter, or butter and lemon, possibly something sweet, and then rolled up and eaten. 1 2 Nelson, Libby (29 November 2015). "British desserts, explained for Americans confused by the Great British Baking Show". Vox. Retrieved 2015-12-03. ↑ "The Food Timeline--history notes: muffins to yogurt". foodtimeline.org. Retrieved 4 August 2015. ↑ Abdullahi, Mohamed Diriye (2001), Culture and Customs of Somalia, Greenwood Press, p. 113. ↑ Hassan, Elham, Little Business Women Small enterprises supporting Yemen's poorest families, News Varieties, 16 October 2004. ↑ Boer op ons werf at landbou.com (via archive.org). ↑ Liu, Junru (2011). Chinese Food (3rd ed.). Cambridge University Press. p. 12. ISBN 978-0521186742. ↑ Marks, Gil (2010). Encyclopedia of Jewish Food. Wiley. pp. 56–58. ISBN 9780470391303. Retrieved 18 April 2012. ↑ "Gervase Markham (Pancakes)". Hertes of England. Retrieved 12 February 2016. ↑ Travel Amsterdam: Illustrated City Guide, Phrasebook, and Maps - MobileReference. p. 690. ↑ "The French Influence On Mexican Cooking: La Comida Afrancescada". mexconnect.com. Retrieved 4 August 2015. ↑ "Canadian Ministry of Forests (2000) "Bannock Awareness"". Retrieved 25 December 2013. ↑ Uribie, Millizen "Creole Cravings" Hoy Digital 25 February 2010 Archived 1 March 2010 at the Wayback Machine. ↑ "DR1 - Daily News Thursday, 11 December 2008". dr1.com. Retrieved 4 August 2015. ↑ Panqueca: Receita básica sem glúten – Especial Dia Internacional dos Celíacos – Aqui na Cozinha. May 20, 2012. Retrieved January 5, 2015. ↑ Puba pancake lasagna with beef jerky filling – Aqui na Cozinha. November 30, 2011. Retrieved January 5, 2015. ↑ Sánchez-Borges, Mario; Suárez-Chacon, Raúl; Capriles-Hulett, Arnaldo; Caballero-Fonseca, Fernan; Iraola, Victor; Fernández-Caldas, Enrique (2009-05-01). "Pancake syndrome (oral mite anaphylaxis)". The World Allergy Organization Journal. 2 (5): 91–96. doi:10.1097/WOX.0b013e3181a0db50. ISSN 1939-4551. PMC 3651046 . PMID 23283016. ↑ "The Presbyterian Church in Canada" (PDF). The Presbyterian Church in Canada. ↑ "Pancake Day (Shrove Tuesday), in the UK". British Embassy, Washington DC. Archived from the original on 23 February 2007. Retrieved 17 November 2006. ↑ "Shrove Tuesday – Pancake Day!". Irish Culture and Customs. Retrieved 17 November 2006. ↑ "Easter in Australia". The Australian Government Culture and Recreation Portal. Archived from the original on 2007-03-18. Retrieved 17 November 2006. ↑ "The origin of pancake racing". Bbc.co.uk. Retrieved 2014-02-28. ↑ "Olney Pancake Race". ukstudentlife.com. Retrieved 4 August 2015. ↑ "Pancake Race 2007". archive.org. Archived from the original on 2010-02-06. Retrieved 4 August 2015.